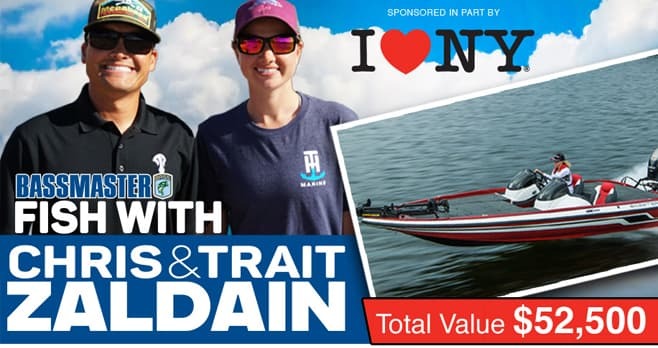 The Bass Master Fish with Chris & Trait Zaldain Sweepstakes is your chance to win a trip to fish with Chris and Trait Zaldain. Plus, you will receive a new bass boat! Register daily at bassmaster.com/fishwithzaldain. The Bass Master Fish with Chris & Trait Zaldain Sweepstakes is open to legal residents of the 48 contiguous United States, including the District of Columbia, age 18 or older at the time of entry. The Sweepstakes begins at 12:00:01 AM ET on Saturday, December 1, 2018 and ends at 11:59:59 PM ET on Sunday, March 31, 2019. There is a limit of one Entry per person per day, regardless of the method of entry. The grand prize consists of a trip package to Waddington, New York to fish with Chris Zaldain and Trait Zaldain on the St. Lawrence River and a Skeeter ZX190 Bass Boat. Visit www.bassmaster.com/fishwithzaldain to enter and see Official Rules for details.